Peter the Great took the title of emperor in 1721. At the same time his nation became an empire, and St. Petersburg became its capital. The city was the imperial capital for two centuries, until 1917 when the last Russian emperor, Nicholas II, abdicated the throne and the empire ceased to exist. The Russian empire was vast. The 1897 census showed a population of 125,640,021 on an area of 18,861,474 square versts. St. Petersburg was the empire’s heart, mind, focal point and center. The capital did everything it could to ensure the prosperity of the empire. The capital was beautiful and sparked the imagination; there are few such cities in the world. From the city’s founding, the best architects were invited to make it magnificent. The capital — built according to a single plan, full of exquisite buildings and ensembles — was the empire’s architectural masterpiece and served to make it even more prestigious. All the imperial palaces have been preserved: from Peter’s Cabin on the Petrograd Side to the majestic Winter Palace. There are also the palaces and estates of imperial family members, courtiers and statesmen. You need but step out of the hotel to see these palaces: the Kushelev-Bezborodko Palace on Pochtamtskaya Ulitsa; the Nikolaevsky Palace on Truda Square; not to mention the Mariinsky Palace, the Lobanov-Rostovsky house and the home of the Myatlevs on St. Isaac’s Square… and the list goes on. The empire was governed from the capital. Near St. Isaac’s stands the simple, classical, yellow-and-white building of the Senate — the empire’s highest governing body — which oversaw the judicial, administrative and legislative branches of government. Next to it through the archway is the Synod, the highest church authority created by Peter the Great to replace the institution of the patriarch, which he abolished, and to place the Russian Orthodox Church under the state. In the very center of Nevsky Prospect there is a tower displaying the city’s clock. This is the State Duma building, where the members of another, later governing body met. 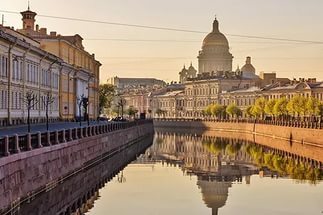 St. Petersburg was the seat of all the ministries which under Peter were called colleges. At that time they were all under one roof in the Twelve Colleges, now the main building of the University, which is located across the Neva River from the hotel. St. Petersburg was the center of live for the emperor and the imperial family. It was here at the Kazan Cathedral that family members would be christened, at St. Isaac’s Cathedral that they would be wed, and at the Church of Sts. Peter and Paul that they would be buried. The graves of all the Russian emperors may be viewed at the Peter and Paul Fortress… except that of Peter III, who died and was buried in Moscow. St. Petersburg was the base for all elite guards’ regiments that led the battle in wars to protect the empire and repel invaders. Their barracks and regimental chapels are magnificent works of architecture that daily remind us of the glorious past of the Russian army. The Cathedral of the Transfiguration on Ulitsa Pestelya, beyond the point where the Moyka River flows into the Fontanka River, was the location of the Preobrazhensky (Transfiguration) regiment. The Izmailovsky regiment and the enormous Izmailovsky Cathedral were located on Izmailovsky Prospect and adjacent streets. Semenovsky Place belonged to the powerful guards’ regiments that started out as the tsar’s «play» soldiers: a group of village boys with whom Peter the Great played war games as a child. The capital also gave the empire many scientists and scholars. The Academy of Sciences was founded in 1724, while the Academy of Arts got its start in 1757. The empire’s museums go back to the famous Kunstkamera. 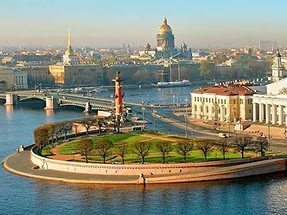 All of these institutions occupy their original buildings on the right bank of the Neva. Opposite these buildings stands the Bronze Horseman. This equestrian statue represents the empire’s founder, Peter the Great, who gazes down on the imperial capital from the height of a perilous cliff.